Doctors told Lindsey he had a one in a million chance he would find the bone marrow match that would save his life. It was a long shot, but he found his match. 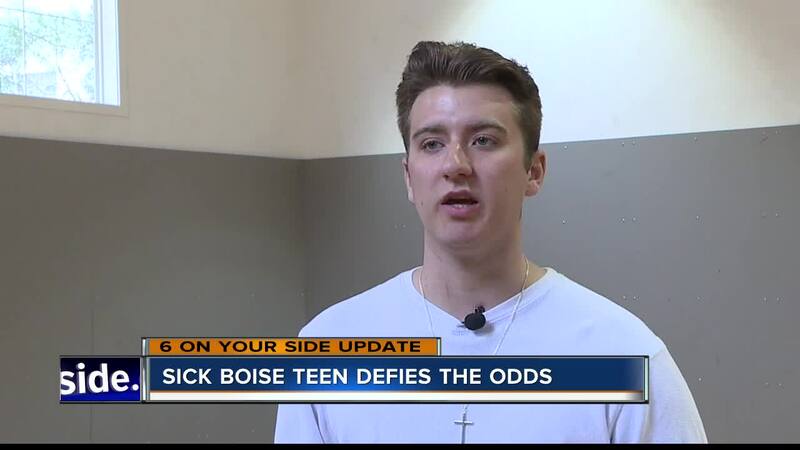 BOISE, IDAHO — An update to a story we first brought you last year: 18-year-old Boise athlete Jake Lindsey was unsure if he'd make it to his graduation ceremony at Capital High after falling ill with a rare blood disease. "It's almost like I was like bleeding through my pores," said Lindsey. "A normal platelet count was over 150,000, and when I walked into the hospital I had 1,000." Now, on the one year anniversary of the harrowing diagnosis of his rare and serious blood disease Aplastic Anemia: a miraculous recovery. Doctors told Lindsey he had a one in a million chance he would find the bone marrow match that would save his life. It was a long shot, and only seconds before the buzzer-- but with his biggest fans cheering him on-- Lindsey was notified he found his match for a potential transplant. "Oh my gosh, it was a blessing... when they say that you're one in a million and that you have a rare disease... You're not like, expected to find a match." His match could have been someone in Idaho, someone in the US, or someone in China-- essentially, he said he has no idea. Having his potential donor will come in handy if he ends up needing a life-saving bone marrow transplant, despite how painful and risky it would be. "I'd have to do a lot of chemotherapy, a lot of radiation," he said. But in another miraculous turn of events: his doctor says there's only a 30 percent chance he would need to move to Portland to get that transplant. "Days right before I was supposed to move, they told me the treatments in prior months had started to work." That alternative treatment, ATG, raised his blood platelet count-- and his prospects. "Playing sports, and doing things I like, and working out again." Lindsey said he has been taking college classes this semester at CWI, and soon, will enroll in business school at Boise State. "I'll be full time at BSU in the fall." Despite his suffering, Lindsey says he actually grew from the experience. "I think I'm a different person from it. A better person," said Lindsey. "Life gives you lemons, you make lemonade. No matter what it is. Um, even if they give you some really dry lemons, you can still make some good lemonade," he said, laughing. He said he still has a long road ahead until full recovery, but he hopes to start playing on some local Idaho sports teams as soon as he starts feeling better.